Questions about mentor training? Here you go! I am training to be a Seminary teacher for my church and in the training, they outline how to make a lesson plan with the purpose of teaching principles so that the youth may apply them. It involved the "crust" skills (context and content) but puts them in their appropriate place as the overall goal of teaching in Vanguard is to change "cores" and strengthen them by helping the students seek for, recognize and identify true principles in all they learn in the world around them. I have had many people ask me, "How do I seek for principles and teach them?" In the above trainings, it suggests that you identify the different segments of material you want to cover and then determine which depth you want to take each one during class, since rarely can you cover all your material to application (at least I can't, by the time you want to add all those cool object lessons and application simulations :)!). The following chart is fantastic and I can see so much potential in applying it in Vanguard! 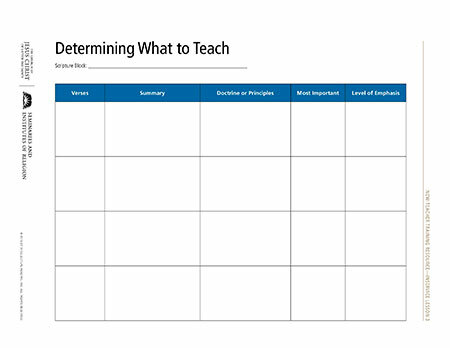 For those who have been uncomfortable "winging it" (as I seem to do), here is a great way to start and for those of us who wing it because we feel like we have to, this is a remarkably concise way to organize and direct our lesson preparation to make it more effective. Not only would mentors benefit from this but think about what would happen for our youth if they were able to take the material they were covering and weigh and apportion inspired depth with their different areas of study!